Getting into video poker is a decision that you really won’t regret. Instead of thinking that you have nothing else to do in the gambling world, why not try to broaden your horizons a little bit? We like video poker because it’s straightforward. Anybody can get into it, it’s not that difficult, there’s a low house edge, and the possibility of some big wins. You are going to be playing alone. If you’re tired of the social grind, then video poker is definitely for you. 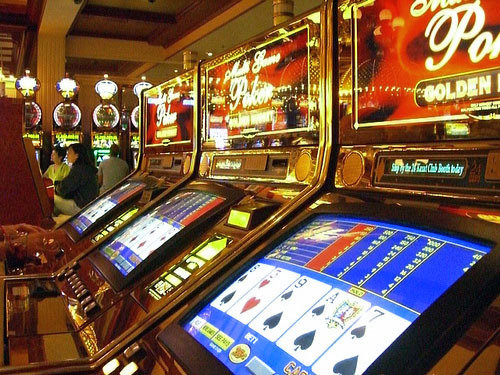 Video poker has some nice pay tables and you still qualify for the same rewards as players that go into other casino games that can be played at online UK casinos. This time around though, you can really do some big things on your own. Let’s cover the subject a little wide and then go into variations later. Video poker is usually played with just one 52 card deck. You can have joker wild games, which will have at least one joker in the deck, but usually more than that. After you make a bet, you usually have to press the deal button. The game is going to give you five cards at random from the deck. From here, you choose which ones you’ll keep, and which ones you’ll toss back. The game will replace the ones you tossed back with new ones that are randomly chosen from the remaining deck. Once you make your hand, you’re paid out according to the pay table. Now then, this isn’t rocket science, right? You figure out what’s going to make the best hand. If you don’t throw something back and you only end up with a lowly pair, guess what? You’re clearly going to be leaving some money on the table. Defining strategy starts with looking at the different variations. There’s Jacks or Better, Deuces Wild, 8/5 Bonus, 10/7 Double Bonus, 9/6 Double Double Bonus, Bonus Poker, Bonus Poker Deluxe — the list goes on. So make sure that you figure out which variation you’re going to play. You also want to look carefully at the return tables for each and every game that you play. They aren’t equal across the board. We promise that we’re not just pulling your leg here. Study right, or lose money. It’s really that simple. Good luck — and stay tuned. We’re definitely not done with Video Poker just yet. There’s a lot for doom and gloom going on in the world of poker, and we find that sad. The reality here is that there’s always time to get into poker, and there’s so many poker players around the world playing the game that it’s unlikely it’ll just disappear. Yet a lot of people are now worried that online poker is going away. The truth is that online poker is a hot button issue — in fact, 1 out of every 4 Americans is supportive of online poker. It’s only a matter of time before online poker is legalized in the country. The truth is that online poker brings in a lot of money, and US players will want to gamble and collect actual winnings. That could be extra tax revenue in the eyes of the government. It’s no secret that the economy is already having problems, so it’s really a good idea to get things moving off the ground. Why wouldn’t you want to play online poker in your own country? The Black Friday shakeup and the closing of PokerStars, Full Tilt Poker, and Cereus (Absolute Poker/Ultimate bet) to US players has changed the landscape. A lot of people used to think that it was okay to play poker online because of these companies operating. However, the government decided otherwise. The law in question is the Unlawful Internet Gambling Enforcement Act of 2006, which makes it a federal offense for any gambling business to knowingly accept payments in connection with the participation of another person in unlawful Internet gambling. Yet the law doesn’t define or alter the definition of what unlawful gambling really is — at this time, it’s only sports betting that’s covered. The Black Friday shakeup changed the game and proved that the government can indeed reach out and clobber online poker sites, and sweep up players in the process. We have full faith that eventually, poker will be legal in the United States. For the time being, the government is losing valuable revenue as players flock to other countries to play poker instead. That’s a real shame, but it is what it is. We think that there’s always a chance for the poker world to turn around. If you have any dreams of being a professional poker player, then it’s definitely time to make sure that you practice, practice, and practice again. Good luck! Pai Gow Poker is an Americanized version of an ancient Chinese domino game. The game is played with a 53-card deck which includes all standard cards plus one joker. 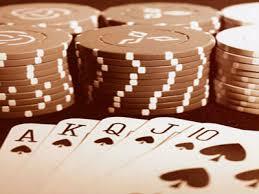 It is played at a table in casinos with up to six players and one dealer. All spots are dealt to—even when there are no players sitting in all positions. 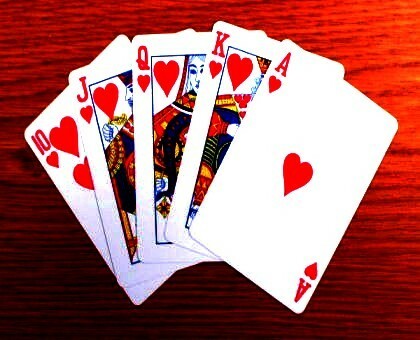 Each player is dealt seven cards to start and he or she must make two hands—one five-card hand and one two-card hand. 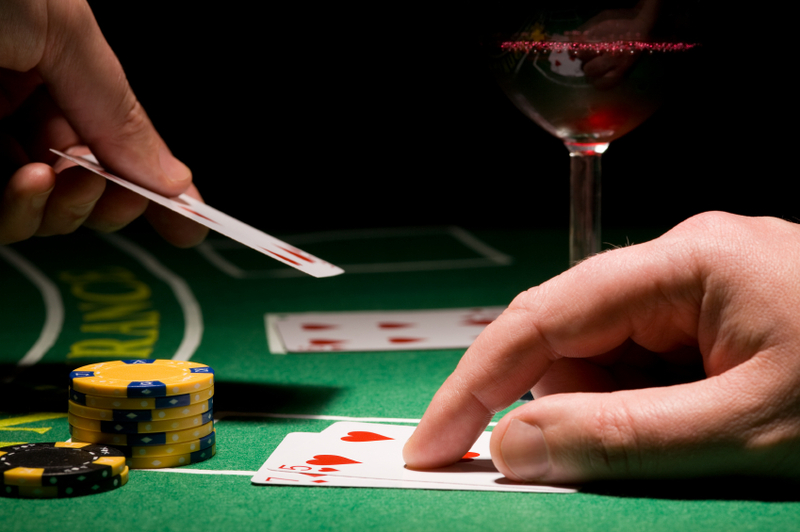 The goal is for both of your hands to beat both of the dealer’s hands; that is a win and you are paid on your bet. If one hand wins and one loses, that is a push and you keep your bet. Finally, if you lose both hands, the house keeps your bet. The five card hand goes in “standard poker value” while the two card hand only pairs or high cards play. There is a standard manner of play, called the house way, which is important to understand if you want to have the best success. One thing you must always remember is that the five card hand must be “higher” than the two-card hand. 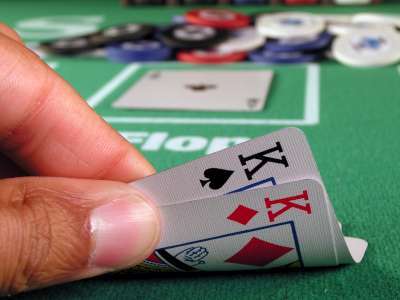 Therefore, if you are dealt one pair and no other “wins” you would put the pair in your five-card hand and your two highest remaining cards in your two-card hand. If you have a straight or flush, you would “generally” put that in the five-card hand and the other two cards in the two-card hand. However, this could vary if you had pairs as well. It can also be tricky to decide when to split two-pair or leave them together. The Joker is not a true wild card – it can only be used to complete a straight or flush (or straight flush). Otherwise it is counted as an Ace. 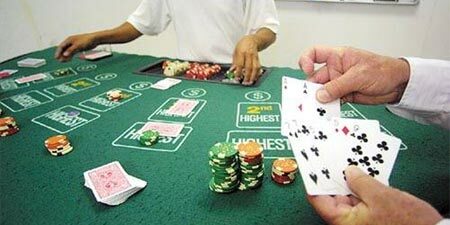 If you are playing in a live casino, you can ask the dealer to help you set your hand “the house way.” Additionally, this is one of the few casino games where it is permissible to ask for assistance from other players at the table. 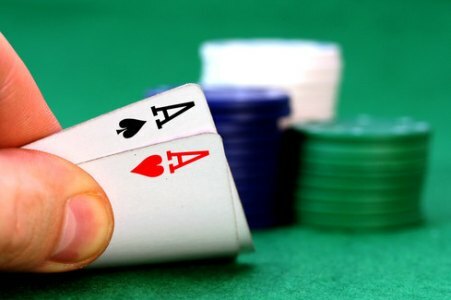 Remember, you want to win both hands, so you may have to split a “big hand” to get a win. Spend some time learning what the “house way” is and consider basing your strategy off of this. You can play Pai Gow online at Virgin Casino. This is a great option for those who love the game and can’t make it to a live casino—or someone who wants to learn the game in a non-threatening, online environment. This version of Pai Gow follows all standard rules and has a bonus bet option to increase your chances to win big. This version has excellent graphics and is a fun way to enjoy Pai Gow from the comfort of your home. Christmas is one of the most loved holidays in history, the gift giving, the time off work, and of course, all the incredible food. 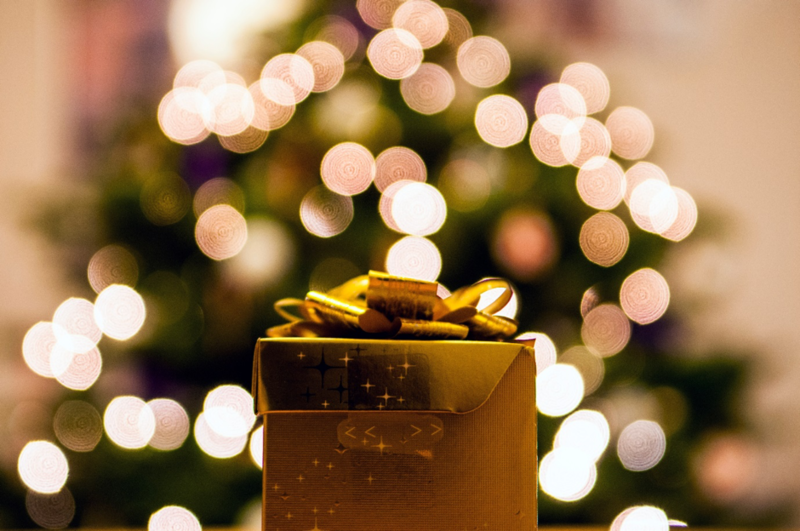 Everyone loves a good Christmas party, so why not try getting lucky this year (and we don’t mean under the mistletoe)! Maybe you’re not a fan of the glitz and glamour of Vegas and Monte Carlo, but don’t feel like trying your hand at online casino games, so why not bring the party to you instead? We’ve put together a piece by piece guide of all the things you need to throw your own poker night and show your friends your party is the place to be this Christmas! From poker sets, decorations and even sprucing up the tree! We’ve taken the hard work out, so you can kick back, relax, and win big this Christmas! Starting with the most vital part of any poker night, the playing cards. 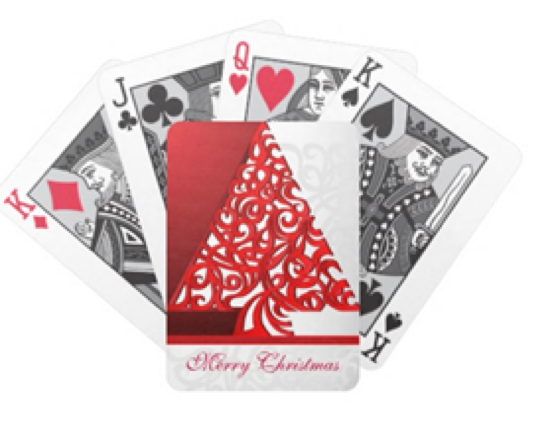 These brilliant “Merry Christmas” cards from Zazzle feature a white and red Christmas tree, with a face to match! All the characters on these cards are in black, white and red. 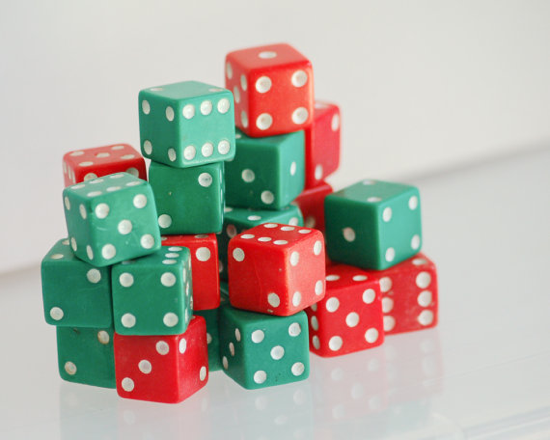 These little red and green dice couldn’t be more perfect for Christmas. A vintage item from the 1950’s, these make for a brilliant edition to any Casino, especially yours! This very sleek poker set from Marks & Spencer’s is brilliant as an all-round starting point for your Casino night, or it can double up as a gift! 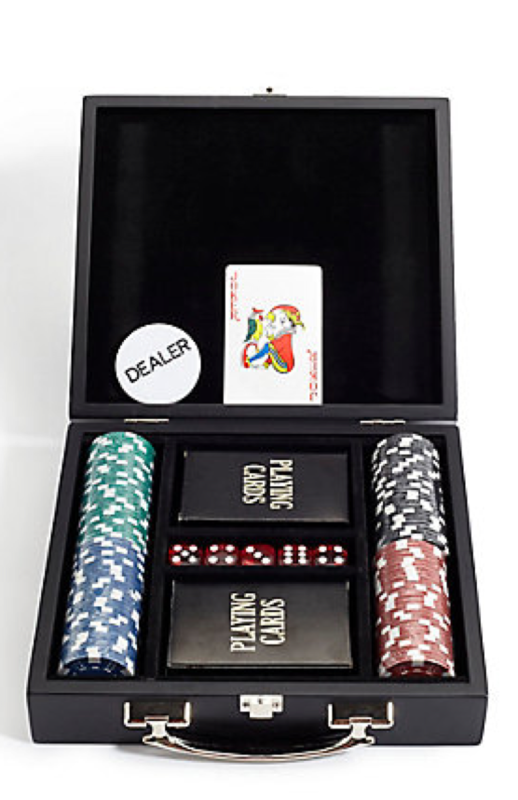 Featuring green, blue, black and red Poker chips, a crafted black wooden case, 5 red dice and two decks of playing cards. No better way to make Christmas feel like Monte Carlo than by glamming up the tree! 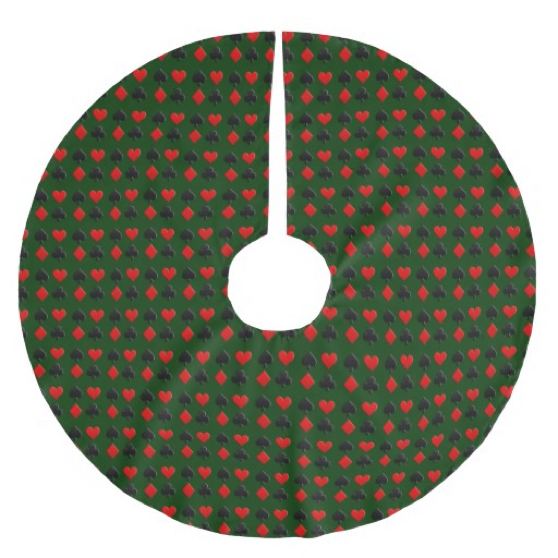 This brushed polyester tree skirt featuring all four card suits is the ultimate addition to your Christmas tree, and to your party! Check out these fantastic ideas for decorating your tree. 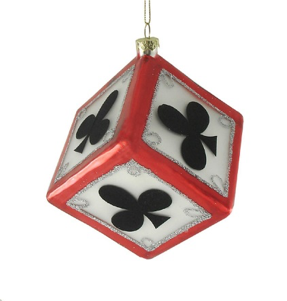 We’ve got these snazzy red and white dice ornaments, these Las Vegas baubles and this brilliant “Santa’s Casino” chip to hang from the tree! 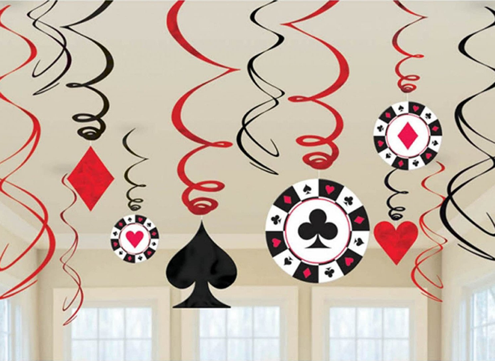 These fantastic casino themed swirls will glitz up any room. Featuring different poker chips and card suits, not only are they perfect for your casino night, they also come in Santa’s favourite colours! When you fancy a break from the cards, why not take on your friends with a game of Drinking Roulette! 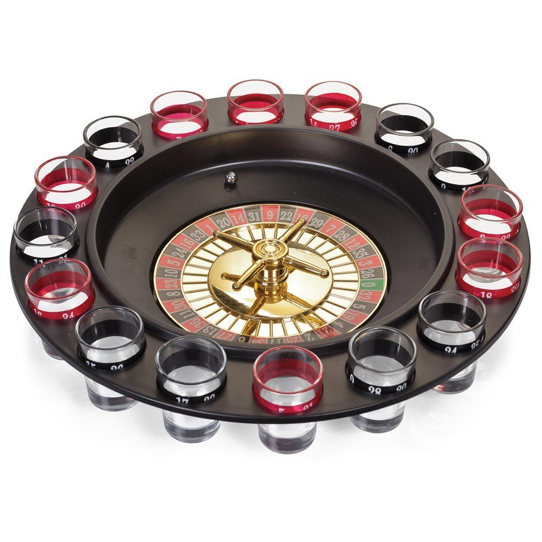 This brilliant idea from Personalised Gift Shop comes with 16 shot glasses and a roulette ball to get the party started! The most fun part of any Christmas Party is the dressing up! These brilliant light up Santa hats add a sparkle to any event, and draw attention to the star player at the table! 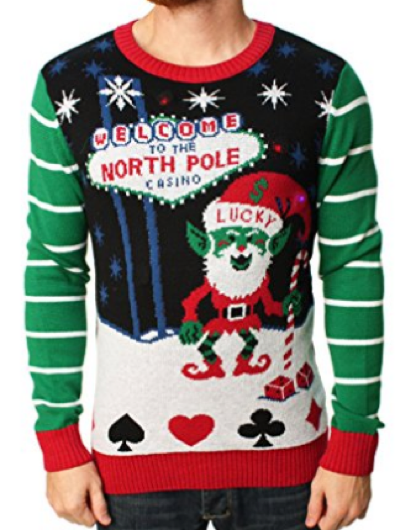 To round off the ensemble we’ve got this hideous (brilliant) jumper from Amazon featuring a lucky Elf, the North Pole Casino and all the things you could hope to see at a Casino! Luck, strategy, skill, psychology — those are the ingredients of poker. However, those ingredients can’t come together without a little glue, and that glue is usually a nice fat bankroll. Now, if you’re trying to build your bankroll in time for a good multi-table tournament, you need to also learn how to protect that bankroll. Yes, it’s true that we’ve covered bankroll management in the past, but the truth is that it’s always a good time to make sure that you’re tweaking your strategy when you’re in tournament play. There are a lot of factors that come into play when tournaments are involved that it’s really a good idea to ensure that you are looking at every factor carefully. So, the first thing that you will need to think about is how much of your overall bankroll you want to devote to any one tournament. It’s said that you really don’t want to invest more than 1% of your total bankroll into any tournament. Now, you have to understand that at the beginning this limit is going to keep you out of a lot of big tournaments. However, that’s the way it’s designed by default — if you were to plunge into every big money tournament that you find, you would end up not having enough bankroll left to cover you for the games that you really want to play. Why would you want to waste good money like that? The type of tournament that you decide on will also make a difference. If you end up only going with the tournament that seems to let you buy more chips if you bust out. It might seem like this would be more a value proposition than just busting out, but beware — these tournaments can lure you into spending a lot more money than you might expect. You would be better off playing tournaments that aren’t going to come with that feature, until you can actually afford it. Make sure that you calculate your bankroll correctly to accommodate this ability to buy back into the event — if you ultimately choose to walk down this path. The 100 buy-in / 1% rule helps you make sure that you’re getting enough chances to make money while also helping you avoid risks. Let’s say that you have a bankroll of $2000. That’s a pretty nice bankroll! With the 100 buy in rule, you can get into tournaments with a $20 buy in and still not blow through your bankroll too quickly. On the other hand, if you only have $500 then you will have to tread carefully. You will only be able to go into $5 tournaments. Many casinos do run these types of tournaments to give players something to do when they don’t have big monster bankrolls. There are still a lot of opportunities out there to grow your money, so make sure that you pay close attention to them! There’s No Time Like the Present to Enter a Sit-N-Go Tournament! Are you ready for tournament play? Maybe you dream about playing a big tournament like the World Series of Poker, or getting into an online satellite tournament to gain entry into a tournament like that. There’s nothing wrong with that at all, but you will need to make sure that you don’t just rush into this. 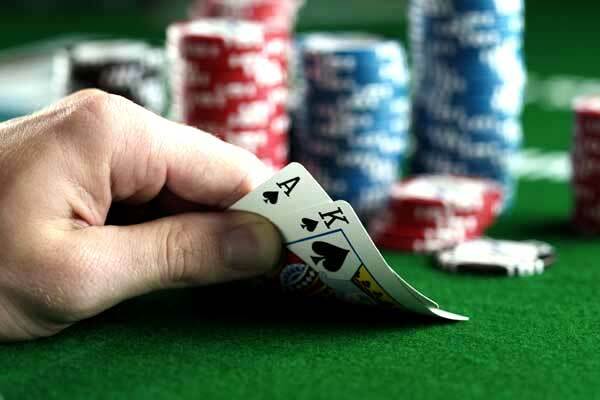 In order to reach the highest levels of the online poker world, you will need to make sure that you practice. One of the first things that you will want to do is actually play a mini tournament, better known as a Sit-N-Go (SNG) tournament. Why is it called a Sit-N-Go? Well, because that’s exactly what you do — you sit down, you pick up your cards, and once everyone has sat down at the table — you go! Of course, there is a certain level of strategy to an SNG. For starters, you will definitely want to aim at being one of the top three players. Naturally, being the first place winner is the ultimate goal. However, you shouldn’t underestimate the power of sitting at 2nd place, where you will get 30% of the table’s entry fees, generally speaking. Most SNGs are about 9 to 10 players big, so you will need to practice good strategy. How do you go about this? Well, we’re glad that you asked! First and foremost, you will need to make sure that you’re being as patient as possible. 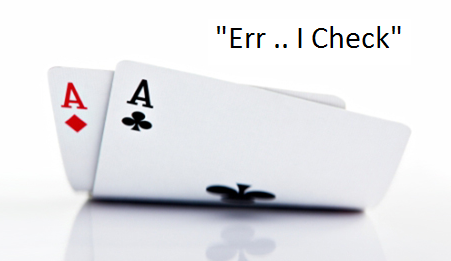 One of the first mistakes that many poker players make in an SNG is that they want to play loose, taking on every hand like it has to be conquered in order to meet the finish. Maybe this works in non-tournament play, but in an SNG this type of behavior will end up costing you a lot of power in the long run. It’s better to play a tight game, entering a hand only when you know that you have a decent hand that actually has a chance. This is not a time to call a bet just to see what the flop will look like! Have You Been Stung At the Poker Tables – It’s Time To Fight Back! If it’s warm where you live and you’re actually indoors playing poker, don’t worry — you’re actually in good company. If it’s warm where you are and you find that you’ve been stung hard at the poker tables, don’t worry — you’re also in good company when it comes to these circumstances as well. It’s not like we’re trying to openly make fun of you, but it does stand to reason that if you really want to break out of your cycle you will need to think about how to fight back. When we say “stung” we mean bullied or otherwise parted with your precious poker chips. If your money is going down instead of up, it’s time to fight back. If you find that you’re tired of playing on emotion and losing big pots that you felt should have been yours, you’re going to need to think about how to fight back — and win. We would be more than happy to help. You see, when it comes to poker it’s really all about being selective. If you look back at your poker games and find that the common denominator across table sis the fact that you play so many hands preflop, then you will want to make sure that you stop doing that and start looking at actual values. Sometimes that low 3-3 pocket pair really isn’t worth it — are you doing your card odds properly? Poker is such a fun game because it demands that you use a lot of different skills in order to come out on top of other poker players. You have to master the psychological game without getting upset or losing your cool, and then you also have to master a few statistics principles win order to make sure that you really come out on top more times than you fail. Math will take you there — emotion will often not. Learning to read players is really what’s going to end up making all of the difference between success and failure in the world of poker. You don’t want to end up giving up in frustration when the answer that you needed all along is right there in front of your face. You will need to study the hands that you’ve played as well. We know that we say it a lot but people really do end up not looking back at past history to even figure out when they’re taking what actions. You don’t want to just rush through things and not see the details for what they are. It can take some time before you can really fight back, but you don’t want to let emotion overrule good sense. You don’t want to stop and think that there’s no way that you can get better in the world of poker when there is always a way to move up. Don’t be afraid to talk with someone else that can help you tighten up your poker game as well. Even though everyone is competing against everyone, there’s really no reason why you can’t make the most of it anyway, right? So, if you’ve been slapped around a bit at the poker tables, it’s definitely time to fight back — use these tips to guide you! Knowing your odds from the start on Texas Holdem – Am I going to Win? A few poker players believe that Texas Hold ‘Em is the most unpredictable card game and that the players can’t know if they’re going to win or not until the game is finished. To me, this is just one part of the medal. The other part is a lot more “sensible”. After a long journey, I have come to discover that most players can indeed have an idea about their odds of winning, and better yet, they can learn from the very beginning. The purpose for finding out if you have a chance at victory is directly related to the fact if you will bet large amounts of money – you wouldn’t want to play against the odds! The starting hand on poker is surely underrated by some. While you can never know your luck on a Hold ‘Em game, calculating some odds from the starting hand is not impossible. You don’t have to be that good in calculating, you simply have to remember a few figures. While I am not suggesting that a bad starting hand means that you’re going to lose the game (you really never know what will happen during a poker game), I am only saying that computing the odds on your mind can be a good indicator about your next moves on the poker table. Let’s begin by taking a look at the probability of receiving a good combination of the hole cards. A standard deck has a total of 52 cards, which belong to four different suits. There are a total of 1,326 possible two card combinations on a typical 52 card deck. However, these odds are calculated by considering the four suits to have different values. Since the suits do not play any role, it turns out that there are 169 possible combinations. That’s a lot less, but not all combinations have the same value on poker. If we look into the odds more closely, we will learn that 13 out of 169 combinations are (successive) pairs and they have better chances of creating a powerful hand at the end. The odds of being dealt a combination of this kind are 7.69%, which is not that good. Nevertheless, there are 78 other combinations of non-paired cards that belong to the same suit. While these combinations are not as good as the first ones, they can also be helpful and useful. The odds of having two hole cards of this type are 46.15%. The remaining 78 combinations are non-paired cards of different suits. These are not necessarily bad since there are some valued hands which might use those particular cards. Again, the odds for this arrangement (which should not be mistaken for the previous arrangement) are 46.15%. All things considered, I would not immediately jump into conclusions from the beginning of a poker game whether I am going to win or not. Instead, my best strategy is to look into my odds and do the best I can out of it, and this strategy has never let down!